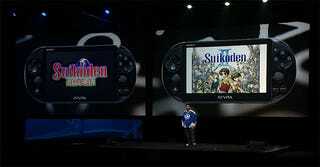 Sony just announced that the classic JRPG Suikoden II is coming to PS3 and PlayStation Vita. Not only that, it'll be available next week. I can already imagine the texts I'll be getting from Jason about this. "Kirk have you started Suikoden II yet?" "Kirk, have you started it yet?" "No excuses. Time to play it. Have you started?" "Hey, just wondering if you'd started Suikoden II yet." "Hey buddy, how's it going? Play Suikoden II."